I was up in Steamboat Springs this weekend for the 30th annual Steamboat Marathon. Well, I was there for the half marathon. I have not yet fallen prey to the marathon itch. 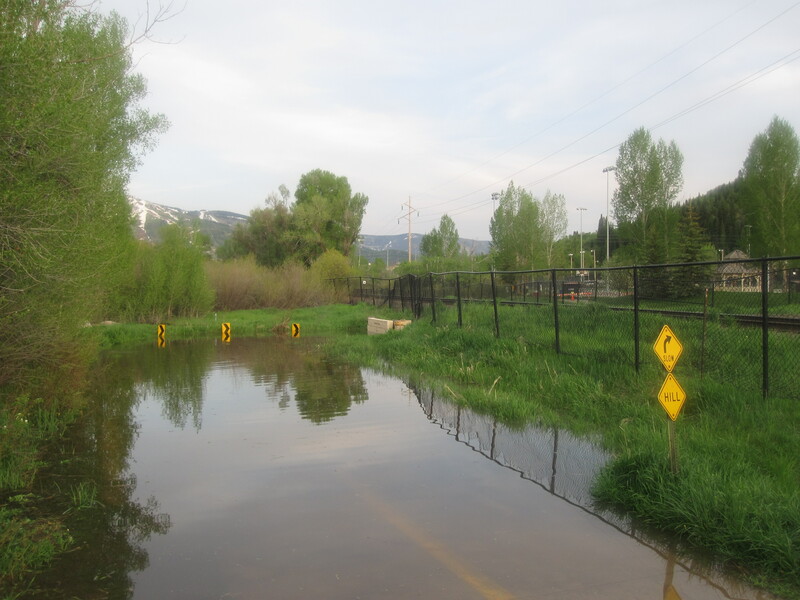 After a winter of heavy snowfall, Steamboat is green, gorgeous, and flooded. Or at least, the Yampa river is bursting at the seams–as are all the other streams and rivers in the area. It’s hard for me, having last visited Steamboat when I was nine, to really understand how high the water is. But this picture of the bike path as it crosses under the railroad tracks really brings it home to me. "What bike path?" you may ask. Exactly! Businesses and homes along the river had lined their foundations with sandbags to protect them from flooding, and I saw a few homes that looked as though the sandbags may not have been entirely effective. Here’s hoping I’m wrong! One report I heard actually said that the river hadn’t peaked yet; more water is yet to come! And yet, with all that moisture, it’s not surprising that everything was incredibly green and beautiful. And warm! The days were hot, definitely shorts and tank top worthy. Even the race morning started out mild, and once we got moving the temperature was about perfect. The course meanders through Elk River Valley, a lovely area with some minor rolling hills, and an overall loss in elevation. I would love to do this race again. 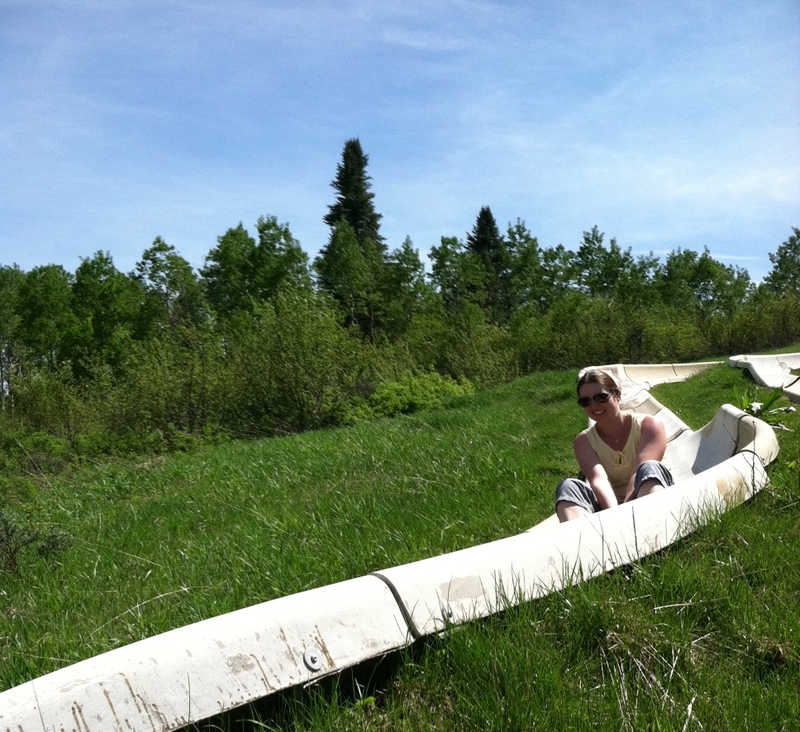 And then….the slide! 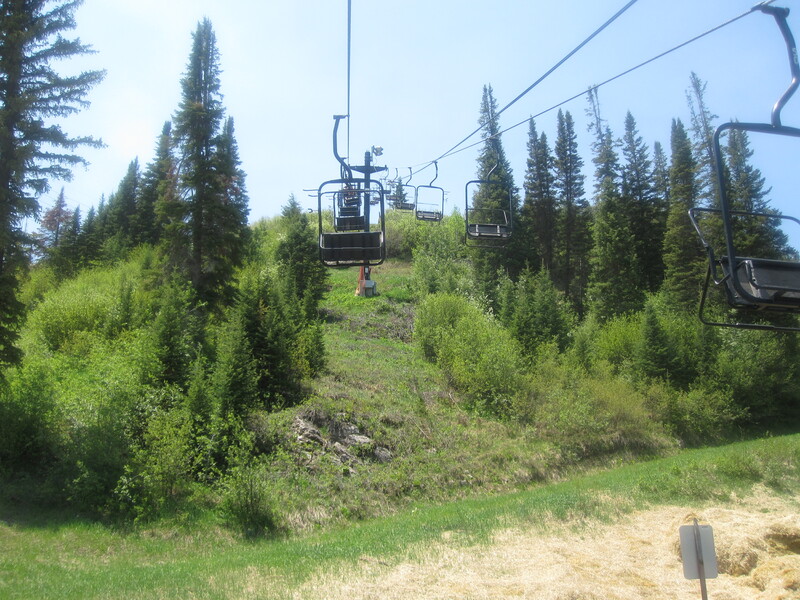 The fabulously fun Steamboat Springs alpine slide, AKA The Howler. This thing is awesome. You take the Slowest Ski Lift Ever up the hill to the top of the slide, then ride sleds down winding tracks to the base of the hill. You can control your speed by pulling a lever (up to stop, down to go). This looked like fun from the bottom of the hill, but was way more fun than I expected. Highly recommended! Riding the Slowest Ski Lift Ever up to the top of the slide. 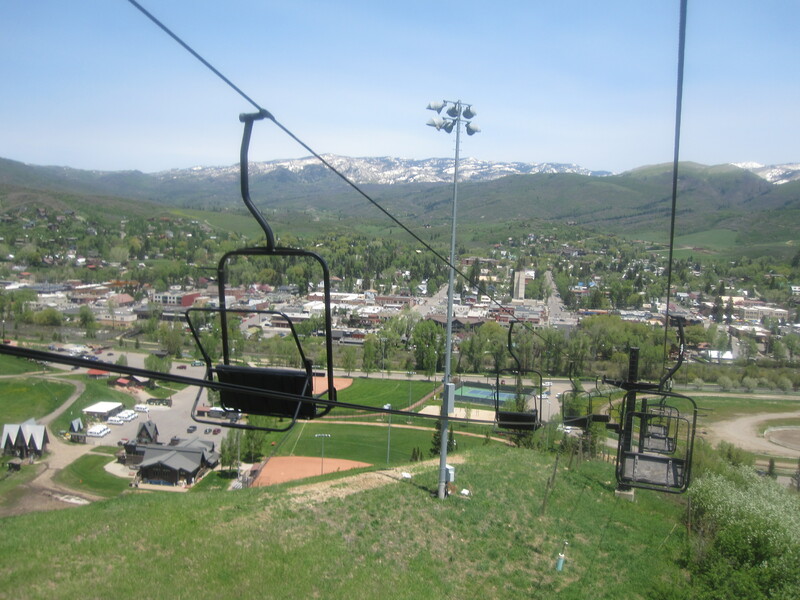 Looking back town towards Steamboat. Can you see how beautiful it is?